We’d love your help. Let us know what’s wrong with this preview of Mind Fixers by Anne Harrington. 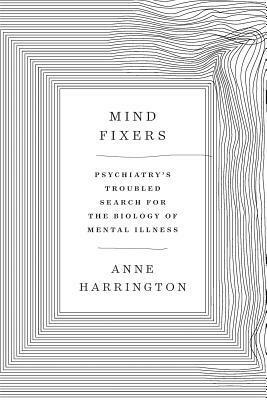 In Mind Fixers, Anne Harrington, author of The Cure Within, explores psychiatry’s repeatedly frustrated struggle to understand mental disorder in biomedical terms. She shows how the stalling of early twentieth century efforts in this direction allowed Freudians and social scientists to insist, with some justification, that they had better ways of analyzing and fixing minds In Mind Fixers, Anne Harrington, author of The Cure Within, explores psychiatry’s repeatedly frustrated struggle to understand mental disorder in biomedical terms. She shows how the stalling of early twentieth century efforts in this direction allowed Freudians and social scientists to insist, with some justification, that they had better ways of analyzing and fixing minds. To ask other readers questions about Mind Fixers, please sign up. The review of this book in The Atlantic was better and more to the point of how psychiatry is a cruel hoax on people who aren’t feeling well. The book mostly focuses on the history of what we don’t know of the biological basis of mental suffering. Which is nothing at all. Even psychiatry’s claims to empirical relief of suffering is hard to take on without trepidation. If empirically I feel less anxiety and better able to face the ups and downs of my daily The review of this book in The Atlantic was better and more to the point of how psychiatry is a cruel hoax on people who aren’t feeling well. The book mostly focuses on the history of what we don’t know of the biological basis of mental suffering. Which is nothing at all. Even psychiatry’s claims to empirical relief of suffering is hard to take on without trepidation. If empirically I feel less anxiety and better able to face the ups and downs of my daily existence with two or three shots of vodka on board does that mean I have an ‘alcohol deficiency’ or that alcohol is a good ‘medicine’ for a medical condition I’m facing? Absolutely not. But that’s the only argument psychiatry has to stand on in the absence of biological physiological understanding of anything at all. The only proof we have that the mind has any sort of existence at all in the physical brain is that brain trauma and drugs that affect the brain cause alterations in consciousness. But when you think of it, it’s not very strong proof of anything. Analogously, if I hit my TV with a sledgehammer it would alter the images shown on the screen, but that is no proof that the images shown there are actually, physically occurring there. The TV is only a transfer point between radio waves and images. Only a primative or the very gullible would believe the images on the TV are actually occurring in any physical sense in their living rooms. I understand why psychiatrists are loath to entertain the idea that the mind does not exist in an entirely physical realm. Physicians after all only deal with things that occur in physical bodies. If the brain is only a transmission point between mind and body, then it would place the mind and mental suffering beyond the realm of doctors and back in the hands of theologians.